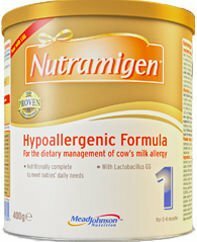 Nutramigen 1 with LGG® is an extensively hydrolysed, hypoallergenic formula for the dietary management of infants with cow’s milk allergy from birth to 6 months. 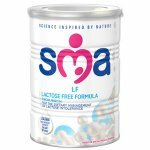 It is nutritionally complete so can be used as the only source of nutrition to meet the daily needs of infants with cow’s milk allergy from birth to 6 months of age. Nutramigen 1 with LGG® is a food for special medical purposes and should only be used under the supervision of a healthcare professional. Wash hands and clean preparation area thoroughly. Clean bottles, teats, caps, and utensils in water (at least 10 minutes at a rolling boil). Boil fresh water As soon as possible, pour desired amount of water into clean bottle and cap. Cool down to room temperature. Do not use softened water. On a clean surface add required number of level scoops of powder (see feeding guidelines). Store dry scoop in the can. Cap bottle, roll and shake well until powder dissolves completely. Check temperature on the inside of your wrist. Only use scoop in tin. Do not press powder into scoop - level off with the back of a clean, dry knife. Add 1 level scoop (4.5 g) to each 30 ml of water. Do not freeze prepared formulaand do not use if unrefrigerated for more than a total of 2 hours. Use formula that has been in contact with baby’s mouth within 1 hour and do not refrigerate. Throw away prepared formula left in bottle and clean utensils.